Why Won’t Anything Grow Under My Black Walnut Tree? Black walnuts suppress the competition. I keep planting flowers around my black walnut tree, and they keep dying. What’s the problem? Black walnut is what’s known as an allelopathic plant, which means it contains a natural poison that kills or interferes with the growth of nearby plants. Black walnut leaves and wood, and especially the roots, contain a powerful chemical called juglone. Juglone is harmful to many garden plants such as nightshade vegetables, azaleas, rhododendron, blueberries, and petunias. Juglone can stay in the roots and soil for years after the tree is cut down, and it’s also present in fallen leaves, debris, and water runoff. Dead grass under walnut litter. Plant Wisely: If you’re planting a black walnut tree, give it plenty of room – the entire root zone of the plant (a circle approximately the size of the leaf canopy) will be affected by the juglone. If you garden near a walnut tree, stick with plants that are known to be resistant to juglone. Examples include Kentucky bluegrass, forsythia, clematis, marigolds, and begonias. Compost Carefully: Juglone can be broken down in a hot compost pile, and it’s best to compost walnut leaves for at least six months. If you have lots of leaves, or you’re not doing hot composting, you may want to leave them out of the pile. As an alternative, you can use shredded walnut leaves as mulch in areas you want to keep clear of growth. 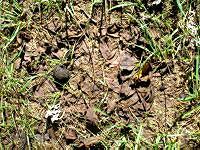 Clean Up: Keep debris and leaves cleaned up around your walnut tree to minimize juglone leaching into the soil. Keep Plants Healthy: Weakened plants are more susceptible to allelopathic chemicals, so make sure your garden plants are in good soil and are healthy.